Marlon Harder and Jose Fuenzalida met in 2001, although their musical backgrounds go back to early childhood. Fuenzalida was working at Pizza Hut when one of his coworkers told him that a friend was looking for a drummer. Say hello to the beginning of Saskatoon’s indie/alt band Autopilot. 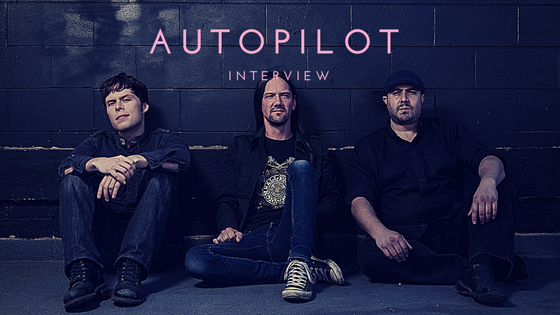 Autopilot has such a refreshing outlook on creating music that is unlike many musicians you hear today. They aren’t looking for the easiest way to get to the top, they’re looking to hone in on their talents and share their passion with anyone that will listen. Harder watched an interview with Dave Bidini of the Rheostatics where he was quoted to say, “There’s people that have to do it and there’s people that want to do it,” and that really resonated with him. “When you have to do it and it’s not a want, you have to have that drive. At that point I was probably 14 or 15 watching this and I thought to myself ‘I’ve been playing for hours and hours a day trying to write songs, I think I have this drive and I should do this.’ Ever since that day, something connected with me that you have to have the drive to do it or you won’t leave your hometown or really accomplish anything,” Harder said. Autopilot has really mastered the art of staying relevant within the music industry. They’ve kept up a momentum of switching between releasing LPs and EPs and recognizing that attention spans are not what they used to be. “If you do an EP, it’s less songs and takes less time to make so instead of going a couple years in between a release you can do one a year pretty much. It helps keep you relevant,” Tenold says. Their latest release, Hurricane/CrookedLines, are two tracks from their upcoming full-length album, which will be dropping in 2017. The band explained that they’re taking a different approach to this record, giving them a little more time to work on it and challenging themselves on creating distinct sounds that they haven’t tried before. “The dynamics of the songs are a little bit different but there’s going to be, still within the album, a bit of diverse sound,” Harder said. “It still sounds like Autopilot but more modern,” Fuenzalida added. By sharing their music the way they want to share it, is by far the best game plan a band can use.